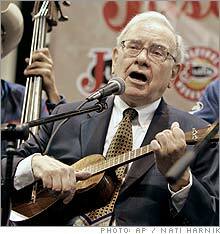 The annual Berkshire Hathaway shareholders meeting was held in Omaha this week, and once again, Ukulelia's Honorary CFO, Warren Buffett brought along his uke. This year, he played his tenor uke (a Martin, perhaps? ), sitting in with the Quebe Sisters. Maybe I need to contact the Justin Boots folks and talk to the about making Mr. B a Justin Uke.